AutomotiveDesignClub International - BERTONE 100 Years - Our Homage. BERTONE 100 Years - Our Homage. Stile Bertone is now up for sale. In block or parts. It is hoped that soon the company established by the father of Nuccio Bertone 102 years ago return to life and creativity under a professional management. The sorrow is so great that mane friends, which whom we produced a story for the unpublished e-magazine Kinetika, have asked me to publish that homage written by the excellent Enrico L. Fagone, on the occasion of the centennial of the oldest Italian coachbuilder still in existence. We like to bring and to show that report as it was made up by the talented painters and graphic designers committed to the Kinetika project through this PDF file. Bertone 100 Years. The Function of Shape. But for those who wants to see it on line, here it is. Although in a simpler graphic composition. "As an object, the car has been the most significant product of the industrial civilization. No means of transport has proven to be as flexible, independent and at the same time as costly for the overall balance sheet of society. As a product, despite the problems of our time, the car is nevertheless completely irreplaceable and indispensable. 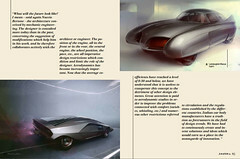 From a product and design point of view the car represents a particular sphere of application of the most ample design culture. It is often claimed today that cars all resemble one another; this is in part true, especially in the general roundness and in the details which are conceived by the designer, but which are suggested by the laws of aerodynamics and by the need to express actual psychological security. What will the future look like? It is not easy to predict it, since the architecture of the car can be very influential." In 1994 while I was engaged to realize the first car-design monograph issue of Ottagono, the most prestigious industrial design magazine published in Italy since 1967, when I heard Nuccio Bertone, saying those words. Probably if we see today at the contemporary car design scenario, we can confirm that an increasingly high number of carmakers are now recovering icons and models of the past to offer their patrons’ real "custom-made" limited edition or small series cars. In the past few years the motor vehicle sector recorded a general homologation to parameters that up to some time ago, allowed distinguishing the various brands considering their reliability, technological development and above all formal identity. The demands of increasingly varied and different customers that were in contrast to such a homologating trend forced sector industries to find new model typologies and to differentiate the various models giving categories that have always been labelled as "niche" once a more precise and strategic role. MASERATI TAKE A NEW START FOR ITS SUV PROJECT. You are here: Home News & Facts Yesterday BERTONE 100 Years - Our Homage.